Highly recommend! Both Kevin and Nikki did a fantastic job and helped make it a perfect wedding and evening. The entire event felt totally seamless, the space was stunning, and everyone (including us) raved about the food. Not to mention perfect coordination with the band and vendors, which was a massive relief. It was such a magical evening and we feel very lucky to have had it at 1 Hanover. This was the most incredible team to work with, they truly had such a professional staff and the service / food / experience was perfect. Kevin, Nikki and the team were such a pleasure to work with, I cannot say enough! The venue is also spectacular and the most wonderful backdrop for a memorable wedding / event. We cannot recommend the India House enough to friends and family. Kevin was absolutely top notch - respectful, thorough, understanding and, best of all, patient. Our guests couldn't stop talking about the place. They all kept saying they should party there every Saturday! I have already recommended Kevin, Nikki, and the rest of the One Hanover Square / India House team to friends getting married. Not only was the space beautiful, the food amazing, and the staff more than accommodating, but Kevin and team made the year of planning my wedding as stress free as possible. My husband and I came in with a very specific vision of a beautiful, fall, black tie affair, and Kevin was with us every step of the way to ensure it was perfect. We felt so confident in working with him and his team that we even cancelled previous plans to host a brunch at a different venue and chose to do it the next morning at India House. We have never received so many compliments on both the wedding AND the brunch the next morning from guests. Kevin, Nikki, and the chefs went above and beyond, even going as far as inviting both sets of parents to a private drink at India House to ensure their fears about the day were put to rest. Kevin was also a text, phone call, or email away, and was never afraid to give us an honest answer. We hope to host many, many more events with Kevin and team in the future! Best wedding decision we made!! We cannot say enough wonderful things about Kevin, Nikki and the team at the India House. We were married at the India House on 8/11/18. Kevin is such a professional! We knew we were in great hands from the moment we met Kevin for our first tour of the venue and he and the team only continued to exceed expectations throughout the process. He was responsive to every email and phone call, no matter how small the detail/request. Our actual wedding day was smooth and flawless thanks to the team. Nikki was INCREDIBLY patient with me and my last minute requests/questions. She also took special care to ensure our family heirloom, cake cutter, was packed and given to a responsible party/in safe hands (my parents) at the end of the night. The food was great. Our guests especially liked the wine selection and late night food station. The venue itself is fantastic. We loved the progression of the event with the ceremony on the first floor, cocktail hour on the second and reception on the third. On the financial side of things - after touring several other venues, it was refreshing to meet Kevin and learn about their approach to weddings. The venue is straightforward with pricing and there weren't any hidden fees (which we found in many other venues). We really cannot say enough good things about Kevin, Nikki and the India House team. Thank you for taking care of us, our family and guests. Highly, highly recommended. We were blown away with the level of care Kevin and his team showed throughout the entire process. Our every need was met and our expectations were surpassed. The venue is absolutely beautiful [elegant & intimate...timeless really]. The food is superb [quality and quantity - beginning with the drinks/snacks in the bride/groom suites and ending with the much raved about cookies and sweets that accompany the wedding cake]! It's been over a month and guests still mention the food and drinks (the rare cajun beef, seared tuna and arctic char are musts). The staff are helpful, kind and efficient. We had family come in from Spain [who spoke no English] and they made sure they had staff that spoke fluent Spanish - and went as far as to have the menu printed in both English and Spanish to make all of the guests feel welcome. This was very much appreciated. We would certainly recommend India House; if you decide to go with this venue you can rest assured that you will be in very capable hands. To those of you who are considering - take the plunge, and to those that have already decided - great choice! We can't say enough great things about Kevin and his team at the India House. From the beginning of the process to planning the big day to day of, Kevin was there and made everything seamless! He was especially accommodating about making the entire menu to our dietary restrictions and wedding traditions before, during and after the ceremony. The food was delicious, the venue was stunning; it was everything we could have asked for and more! 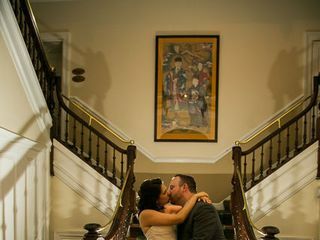 We had our wedding at the India House in April 2018 and it was absolutely wonderful. The building itself is beautiful and a perfect setting for a New York wedding. Kevin was super easy to work with, extremely responsive and did a great job coordinating both before and during the wedding. He made sure that all the little details were perfect and was so attentive to us. He really worked with us to create the wedding we wanted - including allowing my husband to put together his own beer list. Kevin's team does a wonderful job from top to bottom. The food was absolutely delicious and earned rave reviews from our family and friends. Best of all, the prices are really reasonable, especially considering what an incredible value they're offering. I really can't recommend the India House enough! Any venue can provide good food. What sets this venue apart is the whole package. The venue is a museum. The history makes it memorable. From the grand double staircase to the main ballroom, to the working fireplaces, and the historic fixtures. The setting is very unique for a traditional wedding. Kevin, the General Manager was wonderful. He was easy to work with, allowed us to make numerous changes, some last minute, and OVER delivered on all his promises. His guidance was invaluable and he was present and available during the affair. His team was extremely professional and oftentimes proactive in their endeavors. The guests are still calling us wowed over the entire experience. The food was perfect. Our selections for the cocktail party included carving tables of pastrami and turkey, a pasta station, lollipop lamb chops, mini lobster rolls, potato pancakes with sour cream and smoked salmon, seared tuna, and numerous other finery. The selected main course included bronzini, rack of lamb and other choices. Everything was amazing. The hotel was less than a block away, perfect for the elderly staying there. The venue is handicap compliant, with restrooms and elevators on every level. 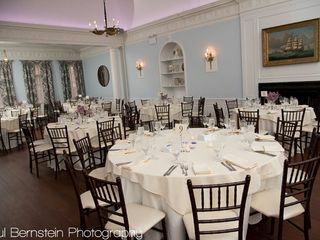 Another benefit of 1 Hanover Square/Masterpiece Caterers, is the availability of multiple rooms. 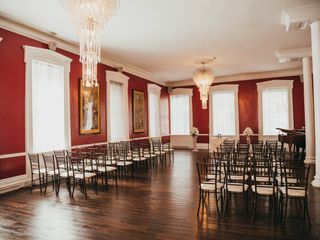 We were able to use many, ie: bridal suite, groom suite, rehearsal room, signing of marriage license, meeting with the rabbi, breakfast the day after, the main foyer for the guests to assemble, the red room for the ceremony, the "trading pit" for the cocktail party, the Marine room for the grand reception. Finally as the guests left, we had cookies, hot out of the oven for our guests. WOW! The next day, we had a wonderful breakfast. Service was outstanding, from the bartenders, to the waiters, and the captain. The staff are professional, and perfect, like a well oiled machine. For the services provided, the cost was very reasonable. Would absolutely return !! Our wedding at the India House was incredible. The wedding coordinator we worked with was absolute perfection. He was so easy to communicate with and accommodating for our requests. From cocktail, to dinner, to dessert, the food was spectacular. Our guests could not rave more about the wedding cake and the amazing Harry Met Sally deli station in the cocktail hour. We would absolutely have another event there in a heartbeat, and plan to return to the Blue Bar every anniversary. We had our wedding here because I love historical buildings and everything was maintained and decorated so nicely. All the food was fantastic and there were so many rooms for the guests to hangout in, the red Hanover Room, the Blue Bar, the welcome lobby beautiful art; something for everyone. Kevin made sure all our concerns were addressed and carefully explained to us with his industry expertise and accommodated us with our request for last minute room changes of the different events of the night. He takes his job very seriously so there is no detail too little for him to handle so you will be in good hands with him and his team. THIS PLACE IS THE BEST!!! You cannot go wrong. I couldn't have dreamt a better wedding. The service, food, decor, ambiance, and the attention you get from India House (1 Hanover Sq) is unparalleled. My friends and family were blown away. Everyone so impressed and said this was the best wedding they have attended. And I really give India House the credit for this. Their service for flawless. And the venue captures the energy, elegance and class of a NYC wedding. And I can't say enough good things about Adam Hartofilis (Director of Catering at India House). He is a perfectionist. Trust me when I say he cares more about your wedding than even you do. And he really does fulfill all your wishes. Adam is AWESOME. Trust your wedding plans to Adam and you will be amazed. Thank you so much to everybody at India House, especially Adam. Thanks to Kevin Mattner, who managed everything, and his excellent staff, Dorothy and James had the wedding of their dreams! As parents of the bride we couldn't be happier! The professional help and guidance Kevin patiently provided for us regarding every decision we needed to make was invaluable and spot on! The food was amazing and the entire staff did an outstanding job, providing impeccable service throughout the entire evening! We have heard from many of our guests and the compliments have been effusive. So many people said that this was the best wedding they had ever been to! Consistently mentioned, was the beauty of the venue, the great food, and the attentive staff. We want to thank The India House for making Dorothy and James's wedding such a beautiful celebration. The day was perfect from start to finish! It was a wonderful confluence of outstanding professional management on the part of Kevin; a very attentive, friendly and competent staff; fabulous food and a gorgeous venue. Thanks to all at the The India House, we will have memories to cherish for a lifetime! Not sure if words could describe how happy we were with India House as our wedding venue. It's stunning on it's own and with the food and service and overall attention to detail it really made our wedding so special. Adam & Kevin put with our million emails and questions, helped us with everything along the way and felt like family at the end of it. We loved everything about our experience!! 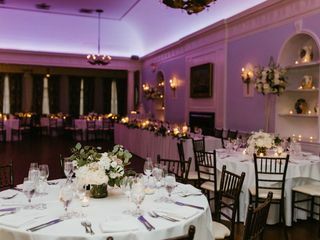 If you are looking for a classic NYC wedding that won't break your budget but still feels like a million dollars, book India House at 1 Hanover Square. 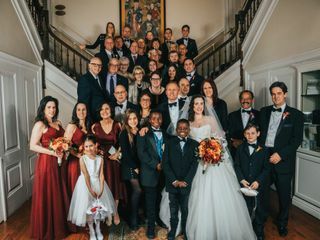 From the setting itself - a 1835 building designed after an Italian Mansion that is cloaked in history - to the first-class staff, the 5-star food and top-notch service, our wedding was beyond exceptional. It was all I could've hoped for - and more. From day one, we felt we were in good hands. Kevin Mattner was accommodating, organized, on top of every detail and personable. Plus, he provided excellent suggestions on decor and recommendations for how to structure the night of the wedding. Working with him was effortless and stress-free -- especially the day of the wedding! I attribute the success of our event to him and his attentive staff. Aside from the staff, the food is amazing. From the abundant cocktail hour to the three-course dinner that was out-of-this-world to the outstanding wedding cake, I still can't believe we received this kind of quality at our very own wedding! This is something I'd expect from the best restaurants in NYC. Needless to say, we'll be visiting the Blue Bar there often. Finally, the price is very affordable. It's amazing everything you get with this venue. 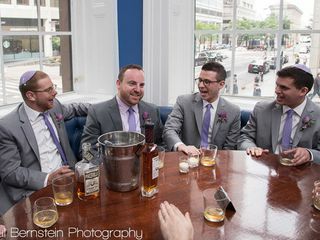 Between the outstanding food and drinks, A-list service and being able to entertain our guests throughout the historic NYC building (we had our ceremony on the first floor, cocktail hour on the second floor and reception on the third floor), I'm sure people think we spent much more than we did. Our guests keep telling us this is the best wedding they have been to and to me, that's the ultimate testament to this venue. It's a special place. If there was one thing I did right for our special day, it was to chose India House at 1 Hanover Square. I want to re-live that night for the rest of my life! My husband Grayson and I got married here in September 2017. Kevin was our main POC from the venue. He helped build out an amazing weekend for us and our family. Friday was a welcome dinner at India House. We did welcome cocktails in the downstairs Red Room. It was the perfect place for us to greet our guests and close enough for us to sneak away to their magical blue room bar to take photos of just the two of us. Our wedding was that Saturday at their other location, Elevated Acres and Dune Studios, just a few blocks away. We held the ceremony outside at Elevated Acres and danced the entire night away in Dune Studios. Kevin handled everything for us! Lighting, staging, rentals, floor plan and the food were all incredible. He was very responsive, professional and flexible with whatever task we gave him. We planned our wedding while living in San Francisco, so having Kevin on the ground was invaluable. He was trustworthy and reliable, therefore we knew the vendors he suggested were reputable. He handled all of our outside vendors including chalkboard artists, magician, balloon vendors and even our live doves vendor! I highly recommend hosting your wedding at India House, Elevated Acres and Dune Studios. Check out our pics...we had a blast! Where do I even begin- Masterpiece catering was an absolutely dream to work with! Drana and Adam will fabulous and the venue is so beautiful. The food was simply outstanding and everyone is still raving several weeks after. I highly recommend India House! LOVE! Kevin Mattner and the staff at India House are the best!!! They made our wedding a smashing success!! And the rooms are gorgeous. Highly, Highly recommend this place for your wedding. 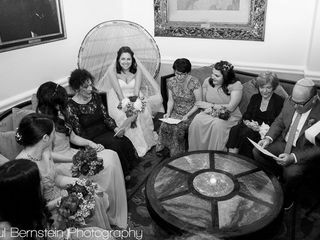 My wife and I were married on August 26th at India House in New York, NY, and the event was hosted and choreographed by Masterpiece Caterers. India House exuded quality, excellence, and class. The décor was a fantastic blend of nautical memorabilia and antiques interspersed with architectural elements that made for a wonderful setting. Our wedding ceremony took place on the first floor, followed by a cocktail reception and then dinner and dancing on the second floor giving us the feel of being able to utilize a very large space. Views were magnificent from all vantages. The food was amazing, and more than a month later, we are still craving the delectable delights from our special evening. One would be remiss not to give attention and gratitude to the staff. They were everywhere - a tighter staff to patron ratio than one finds teacher to student in schools. The staff became immediate family, and our wedding involved a fair number of children who stayed up way too late. The staff were attentive to all of their needs ranging from off menu items to please youthful palates and extras on desserts. One cannot overstate the importance of enthusiastic and motivated staff in making one's wedding exemplary. Finally, we would be completely remiss without recognizing Kevin Mattner, who is clearly the heart, soul, spine, and foundation of Masterpiece Caterers. For months, Kevin took us through every step from beginning to end, from every tasting, to every referral, to suggestions we had never considered, he made our evening a success way beyond our dreams. His attention to detail and his patience when there is so much happening is clearly a testament to his decades in the business and experience pulling off the best year after year. Kevin is indeed a maestro who conducts a world class orchestra at Masterpiece Caterers. Thank you for a wonderful, wonderful experience. Words can not express how AMAZING our Art Deco themed wedding was at India House on June 17, 2017. The entire team at India House by Masterpiece Caters was extraordinary. The catering manager, Arlinda B was a DREAM to work with! The venue was stunning, the food was delicious, the staff was amazing. They far exceeded our expectations. It was my dream to be married in Manhattan, and they made my dream come true! I don't even know where to begin because everything was amazing! From the beginning Kevin and his team were amazing. Our day went flawlessly, and we were taken care of from the moment we stepped into the building. We've gotten tons of compliments on how good the food was, how beautiful the building was, and how responsive the staff was. We could not be happier with our venue choice, they made our day flawless! We got married at India House on May 20. Needless to say it was the most important and magical evening of our lives. All this would not have been possible if not for Kevin Mattner. We have a pretty unique story with Masterpiece Caterers in that we booked it a year in advance. After seeing the beautiful space, we looked at a couple of others and knew in our hearts this was THE ONE. It felt right and it suited all our needs plus the price was just perfect. We met with a wonderful lady who was going to be our coordinator/manager. She left the company and we were transferred to another person. When that didn't work out, we spoke to Kevin and he immediately made us feel at ease and handled our account from that point forward. He is undoubtedly the most professional, amazing, competent person. He knows his job inside out and he really cares about the happiness of his clients. To him, there is no event or wedding too big or too small. Each one must be treated the same and we certainly felt that way. 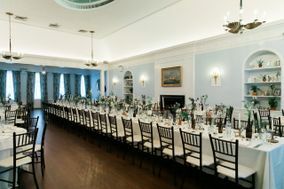 We had our ceremony in the Hanover Room and the entire 2nd floor to ourselves for cocktail hour, dinner and dancing. Everything looked so beautiful and went smoothly. As a bride who works in events, I was very concerned about everything but Kevin handled it all with ease! All our guests raved about the food and the abundance of it. Everything I imagined turned out better than I expected. Everything flowed smoothly. We had a little hiccup with one of our vendors on the night of the wedding but Kevin dealt with it and literally made a miracle happen. He is always responsive to emails and phone calls and he literally alleviated a lot of worries from an already stressed-out bride. We cannot say enough great things about this space, the staff, Kevin, the food and drinks. They will always hold a special place in our hearts and we cannot thank Kevin and Masterpiece Caterers enough for all that they did to make our wedding as beautiful as it was! My daughter and son-in-law got married at City Hall in January, and in April we had a celebration at India House. Our planning was rushed, and we were so lucky to discover this elegant, historic and unique venue. The surroundings were lovely -- our guests commented that they felt like they were in a gracious home, not a catering hall. We didn't have a formal sit-down dinner, but food stations throughout the second floor rooms with different sized tables - large, cocktail and high tops. This encouraged mingling. Kevin, the Event Manager, could not have been more helpful throughout the planning. He was happy to accommodate our requests, enthusiastic about our unusual-style event, re-jiggered the floor plan multiple times as we moved the location of the band and the tables. He had great suggestions, always responded quickly, and bent over backward to make us happy. And he gave us a wonderful price, even including an extra-special food station of our choice. I never imagined that we could have afforded such a sophisticated venue in Manhattan, but the price was right. It was the menu that really sold us, though, definitely not typical wedding food. We had fun and interesting choices -- an Asian station, Mediterranean station and comfort food -- a perfect blend that reflected the diversity of NYC cuisine. Our guests loved sampling different dishes, all delicious. At Kevin's suggestion, we had a late-night station -- NYC street food including hot dogs, pizza, pretzels, and more. This was a giant hit with our guests. And the wedding cake from Financier was scrumptious. I'm still getting phone calls and emails from friends and family telling me what a good time they had and how impressed they were with the food and the surroundings. "Best wedding I've ever been to" is a typical comment. I only wish I had another daughter, so I could do it all over again at India House!